Recent times have brought a consistent change in growing the strength of women's movements and its public visibility. Sisterhood become a global trend although in the last years its presence was performed mainly in internet. The fourth wave of feminism with its “hashtag activism” is responsible for building bonds among women, creating networks of mutual support and strengthening their awareness of social and legal rights. Online social networks allowed women and girls to surf across national, cultural, class and religious boundaries and recognize common conditions, problems and feelings. According to Munro (2013), this flow of communication via social media led to a new awareness, a "call out" culture that challenges misogyny and sexism, by providing a forum for discussions and a route for activism. Online safety zones allow also to grow the feeling of global sisterhood referring to women’s spirituality and community as a form of mutual support focused on special female problems and interests like motherhood, ecofeminism, self-development, healing and education. Participation in internet virtual groups, consisting in both global and local networks, turns out to be the real experience of being strong together, speak by their own voice and finally stand for women’s rights. The “virtual” experience changed the awareness of women and prepared the ground for social protests. Undoubtedly, hashtag feminism is not only “feel good” activity since self-organized women’s groups moved to the real-world expressing anger in the public sphere and experiencing sisterhood. At the same time, Munro points out the unavoidable intersectionality of perspectives that comes from these networks, as they are composed by women and girls from all over the world. A real global interconnection of women’s issues is being realised on the social media, speaking about women’s needs, rights, and different kinds of discriminations, privileges and inclusion. The fourth wave of feminism performed in the internet builds a common field for international feminism (even though each country has its own specificity) that deals with different local articulations of the current new waves of populism, forms of governance based on nationalism, xenophobia and sexism. Some feminist scholars (Zappino 2016) argued that new populism is the expression of what has been named the “Neoliberal Hetero-Patriarchy”, in which neo-fundamentalist and neo-liberal rules co-exist in order to hierarchize sexual, gender, racial and religious differences. This paradigm produces multiple processes of “othering” challenging what was known as the “universal” definition of citizenship: new enemies are continuously created to confirm the supremacy of white, male, western and heteronormative citizen. The populism spreading in world political systems is essentially defined as illiberal, especially in its disregard for minority rights, pluralism and democracy, taking the form of right and left wing populism (Cas Mudee, 2016). The core of the right-wing populism, as practiced in Poland and Turkey, is based on misogyny and xenophobia, which as starting point radically limits the rights of women and LGBTQI people, especially reducing reproductive rights. With the spread of populism, initially in Eastern Central Europe, especially in Poland, a virtual sisterhood proved to have a power in social reality. In October 2016, Polish women connected by social media organized a massive national strike to protest against banning abortion. The facebook group "Girls for girls"” started as hashtag activism results in expressing women's anger and the manifest of self-determination. This apparently out-of-time ban proposal was immediately recognized at a global level as part of worldwide women’s oppression, which inflects differently in each country and continent. We can thus argue that the use of social media, in particular by girls and young women, has opened a new possibility for agency and voice, which has finally expressed in a new women's global movement. From Poland to Argentina, from Italy to India, this movement is claiming for self-determination, recognizing reproductive rights, legal and social citizenship free of sexism, gender-based violence and racism. All these issues concern the fundamental questions of who, how and why produces laws that colonize women’s body, as demonstrated by the recent online protest against Trump’s first decrees concerning women’s health and rights. Hence, we would argue that the global women’s movement is challenging not only single national or international issues, but it is globally challenging the neo-liberal paradigm of law and citizenship. At the same time, the need of re-defining citizenship rights and recognizing intersectional differences produces new social norms from the bottom, which are not included into formal legal systems (Podgórecki, 2011). Feminist movements provide new forms of horizontal self-determination based on inclusion, self-help, solidarity between women, LGBTQI people and migrants. The workshop aimed at analysing from different perspectives and positioning the fourth wave of feminism in the frame of the rising of new populism with an intersectional approach. New populism takes the shape of a “Neoliberal Hetero-Patriarchy” that connects neoconservative and neoliberal rationalities to enforce the control on women's body and reproductive freedom, while hierarchizing sexual, gender, racial and religious differences through a differential inclusion. This produces multiple processes of “othering”, which challenge what was known as the “universal” definition of citizenship. From Poland to Argentina a new global feminist movement arouse to struggle against this new attack on women's freedom, growing the strength of women's movements and its public visibility. Sisterhood become a global trend performed mainly on Internet in what was named the “hashtag activism”, building bonds and creating networks of mutual support and strengthening awareness of social and legal rights. This “virtual” experience changed the awareness of women and prepared the ground for social protests against "the new populism" mushrooming around the world. 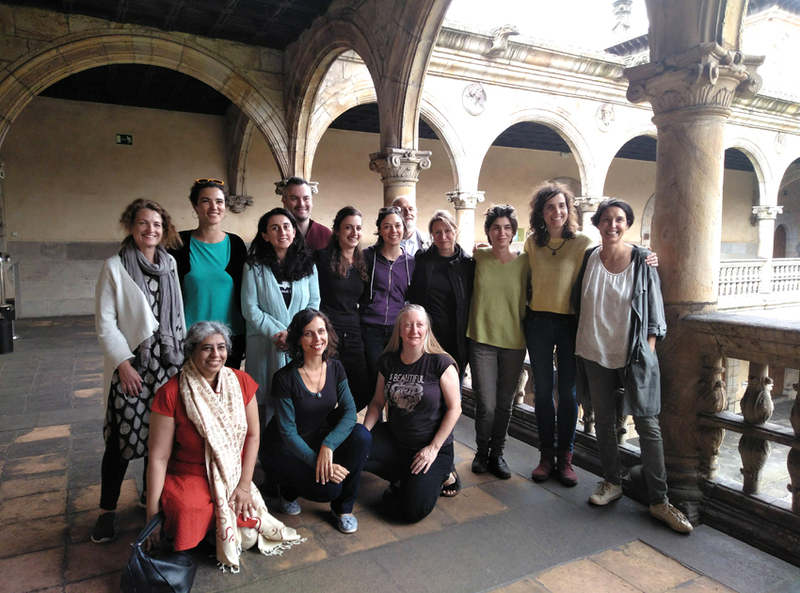 During the workshop women from Italy, Poland, Spain, Sweden, Russia, Brazil and India investigated intersections between the virtual world and reality to recognize national, cultural, class and religious boundaries, common conditions, problems and feelings. This aimed at positioning the current manifestations of the feminist movement, challenging not only national or international issues, but also the neo-liberal paradigm of law and citizenship.